Time flies when one is having fun or if you are working at things you enjoy doing. So its just been over a week since I’ve been in Georgia. Sightseeing did not happen, tho I tried. Only one place to park a RV, I am told, I go and there’s no way I can park there. So went to rent a car, as Saint Mary’s is a historic little town, interesting as I drove thru in my rig.. would loved to have walked around. I rent cars from military bases – basically a good price, but they deliver it to you and pick it up if you are on base. That is except Kings Bay. So tis the first time, I have wished I had my own car… I’ve been doing ok up and until now, but this little snafu was frustrating. All pictures, click to enlarge… and this is especially true on the picture above. I have had a few ask me to post pictures of the gadget that I use to get the yarn onto the back beam of my loom, where the sections are. 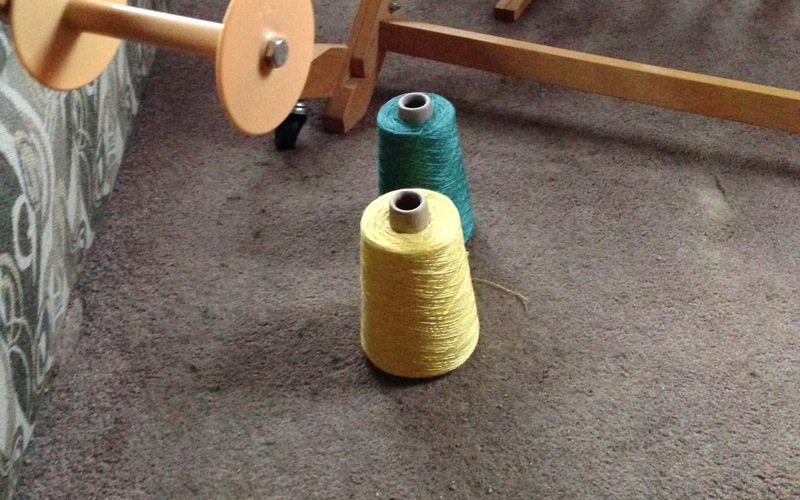 This is the Warping Wheel – in simplistic terms it measures and allows me to place yarn into each section. I break this down completely when I’m done beaming the yarn. It takes up too much room. And the loom, which is pulled out and cocked allows me to get to all sections. These cones of yarns were going to be a baby blanket, that is until I confirmed it could not be thrown into the washer or dryer. One does not give a new Mom a baby blanket that needs special care. Drats! The test was taking strands of each, get them wet, put between two cloths and rub/agitate. I was bummed with the results. It completely lost its luster, soft nature in short order. It looked so ragged, and the fiber did not hold up – it broke. Norm intently watching the yarn coming off cones. Norm was intent on me winding 3 sections of the Tencel onto the loom, before I received confirmation on the fiber. 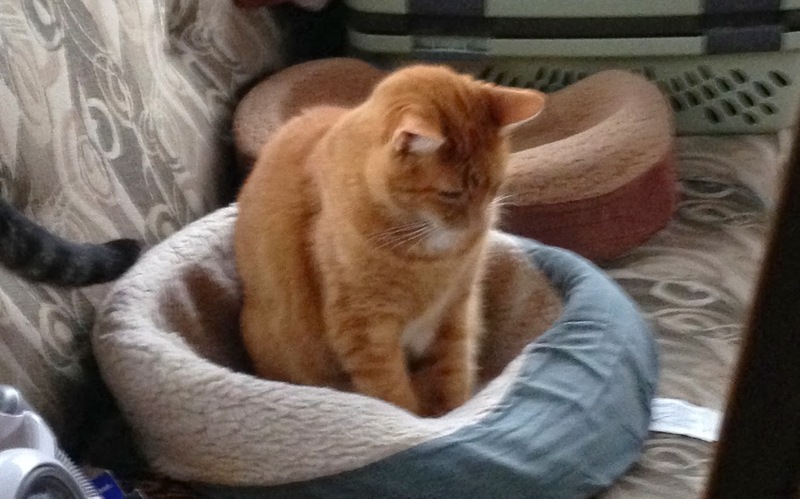 He tried twice to “help” me, but got put back into his bed… Those 3 sections are now off the loom. Now I need to come up with something else for the baby… I will, just don’t know what at the moment. Next thing going onto the loom, as we speak, are organic cotton kitchen towels. Just the feel of this fiber is so wonderful. Will not post pictures of the 3 colors until I get some weaving done. So you will have to wait. We had a bizarre incident last night, actually two… Was reading my book, just before bedtime. And bam, something jumped on the hood of my rig, bounced off the windshield and kept on going. By the time I got to the front all I could see was bushes shaking next to my neighbors rig. The “thing” was a solid mass that hit, soft landing but it shook the whole rig as it got on, ran off. Weird. Then about 45 minutes later, both of my cats were spooked. I mean big time spooked!!! I could not get them settled before I went to bed. I could not see anything out my windows. There’s no way I was going to open the door. Today, I was talking to another RVer who was upset that cats were spraying his wheels and getting into their Class A engine. 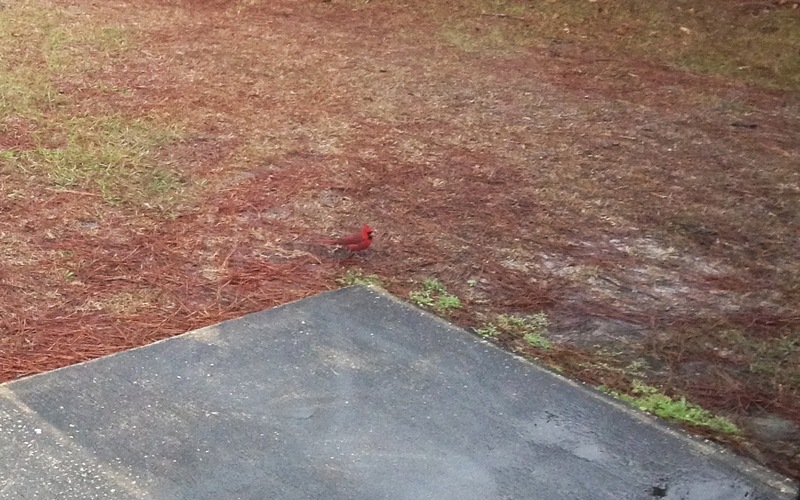 He thought it was the cats that are running loose, who I thought previously were from my neighbors rig – as they fed them twice a day. But never thought house cats would spray tires. Odd. Lo and behold… Camp Host says the cats we’ve seen are strays, been around for quite sometime. But when he heard what happened to me last night he did say bobcats are common here, but they did have a sighting of a panther at the other end of the lake, we are next to, just last week. Egads! Is that what happened last night? Is this why my guys were spooked? Things we probably won’t ever know about. It was quite a night tho. From other RVers still (hadn’t seen anyone until today, its been so dead quiet around here), said the base has their own wildlife inspector/catcher. If they have one, this is not a rare occurrence.. They said as it warms up here… they get called regularly to retrieve snakes, alligators and wild pigs. So guess I’m missing all the actions.. Good. Didn't realize you were still down at Padre Island. Perhaps the weather will clear before you get back home. Its got to turn for the better soon. Red Snapper tho… its been years, but that is good fish. Enjoy your last few days. 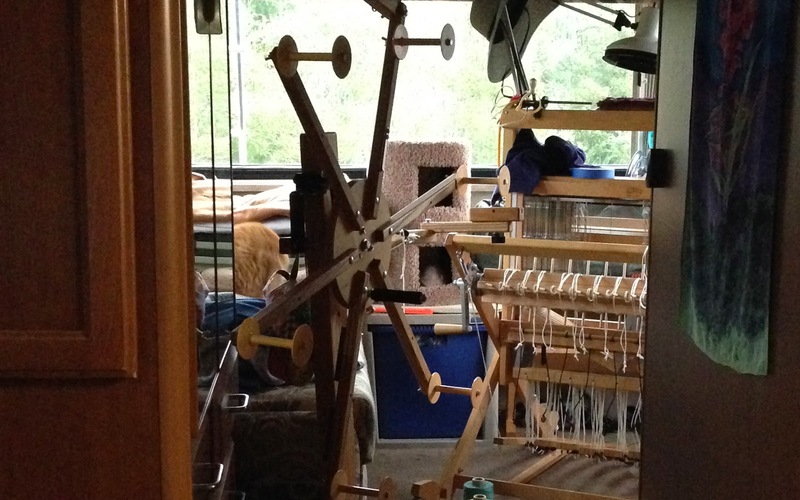 Hi Melinda, It's cool to see your loom and the warping wheel. I just started weaving, on a rigid heddle loom, after taking a class in Austin. Got a Schacht Flip 20″ loom, and think I can weave on the road with it. Loving the weaving! As well as bobcats, deer and a sighting of a panther. Oh, and its infested with ticks. You can't walk the trails without getting covered in them. I picked 17 off of me and I haven't been back out there since. Crazy stuff. How utterly exciting to hear this… If I can weave on the road with my Schacht Baby Wolf, you can do it on your rigid heddle loom. Gosh, this is the best news! So what was your first project? And Jeanne, don't ever throw the 1st away or give it away. Its special!!! Do you have my email address? If so write to me off the blog, I will share lots of sources for you. And have you posted pictures on your blog? Guess I better go look. WOW! Delighted you are enjoying weaving, its one of the most peaceful things I do…Its addicting too. I'm surprised you can keep the cat out of the loom when you're using it. Good to see you creating though. Take care. Next time they're assisting you, take the time to snap some photos, then do a blog about it. That would be a knee-slapper to read.